It’s been a slightly chaotic week that peaked last night when we had to dash off to buy a replacement tent pole, do a last minute shop for perishables and I stayed up until stupid o’clock doing the ironing and watching a documentary about Jodie Marsh going off to do an American body building competition (which was oddly fascinating). Once again I found myself going round Tesco in my running kit, though I did notice at least 3 other women in similar attire (proper kit, not just sporty loungewear. Inactive wear if you like). Which sent me into a slightly sweary rant. Muesli. For MEN. Because clearly real men can’t just have some oats with bits in. Oh no. They have to have MANLY CHUNKS and extra SOUPED UP ENERGY because anything less would be an affront to their masculinty. I despair of this kind of marketing. And who actually wants or needs guarana* in their muesli? Ridiculous. In the midst of all this I had to fit in a Juneathon run, which is how I found myself being thrown our of the car at the side of the road next to what we hoped was an interesting plaque. It was a plaque alright, just not that interesting ( unless you find the 30 year history of a playing field compelling. I didn’t need the plaque because I knew that at the end of a mile or so Ginge would be waiting for me next to a kiwi (suggested by Heather, all the way from New Zealand). *Not to be confused with guano. You wouldn’t want that in your muesli either. I guess Special K is the female version of gender marketing in cereal? 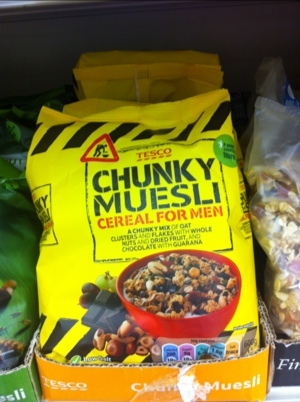 Muesli for men?! I’m getting some for Edward – he can’t eat just one cereal in the morning, he has to have ‘muesli mix’, which is a bowl full to the brim with a bit of every cereal we have in the house. That stuff is made for him! Excellent! Didn’t you do well! I didn’t know how lucky you’d be with that one! Wish I could join you on a run…. I want some of that! I can mix it with my special K! 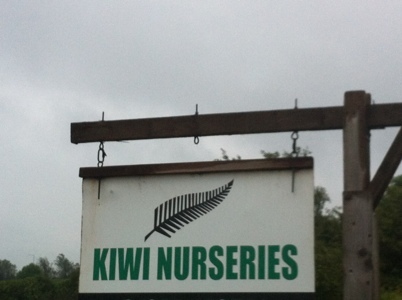 Only slightly sweary – I’m impressed with your restraint.